Aurelia recently acquired her Bachelor’s Degree from the Lithuanian Academy of Music and Theatre, where she studied with professor Vladimir Prudnikov. 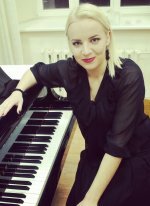 During her studies she successfully participated in several international vocal competitions, including the Tiit Kuusik International Lied Competition in Pärnu (Estonia) and International Competition of Young Musicians Kaunas Sonorum in Lithuania. She has participated in masterclasses of Ulrich Eisenlohr (Mannheim), Gaiva Bandzinaite (Salzburg), Vera Scherr (Mannhaim), Erika Battaglia (Turin), Joseph Valnig (Salzburg), Axel Bauni (Berlin) and Eiddwen Harrhy (London). She has participated in the production of Verdi’s Il trovatore at the Vilnius City Opera, performing the role of Ines.